Whether it is for a kid’s party, a birthday or a thematic event, our pure butter cupcakes decorated with our series of images of princesses, pirates, robots, knights and other super-heroes come to your rescue to make of your event a total success! «Small ones» theme There are 24 products. Our pure butter cupcakes decorated with emojis illustrations on marshmallow fondant will put a smile on everybody's face! Personalize each image with the name and age of the person you are celebrating for only $5 more. Our pure butter cupcakes decorated with unicorns illustrations on marshmallow fondant will bring magic to your guests. Personalize each image with the name and age of the person you are celebrating for only $5 more. You wish to get cupcakes for a little princess' birthday party? Our pure butter cupcakes decorated with princesses, horse, and castle made of marshmallow fondant will conquer the taste buds of the greediest! Personalize each image with the name and age of the the celebrated one for only $5 more. Our pure butter cupcakes decorated with trucks illustrations on marshmallow fondant will delight every guest. Personalize each image with the name and age of the person you are celebrating for only $5 more. Our pure butter cupcakes decorated with colourful Cars & Trucks illustrations on marshmallow fondant will delight every guest. Personalize each image with the name and age of the person you are celebrating for only $5 more. Our pure butter cupcakes decorated with vintage cars illustrations on marshmallow fondant will delight every guest. Personalize each image with the name and age of the person you are celebrating for only $5 more. Your little one likes animals? 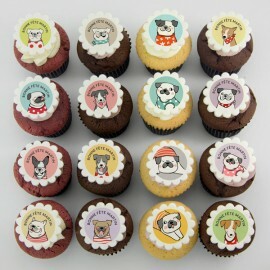 Our pure butter cupcakes decorated with cute dogs made of marshmallow fondant will fascinate everybody at your birthday party! Personalize each image with the name and age of the the celebrated one for only $5 more. Your little one likes animals? 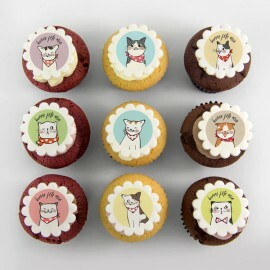 Our pure butter cupcakes decorated with cute cats and dogs made of marshmallow fondant will fascinate everybody at a girl or a boy’s birthday party! Personalize each image with the name and age of the the celebrated one for only $5 more. Your little one likes animals? Our pure butter cupcakes decorated with cute cats made of marshmallow fondant will fascinate everybody at your birthday party! Personalize each image with the name and age of the the celebrated one for only $5 more. Our pure butter cupcakes decorated with jungle animals illustrations on marshmallow fondant will bring colors and fun to your dessert table. Personalize each image with the name and age of the person you are celebrating for only $5 more. Looking for a fantastic idea for a ninjas themed birthday party? Our pure butter cupcakes topped with small ninjas made of marshmallow fondant are irresistible and will be a success! For a mermaid themed birthday party, our pure butter cupcakes decorated with colored mermaids made of marshmallow fondant will charm all the little girls! Hold on! Looking for an edible treasure? Our pure butter cupcakes decorated with pirates, ships, cannons and swords made of marshmallow fondant will be perfect to attrack your taste buds at any kid’s birthday party. Would like to have cupcakes for a baby shower or a little boy’s birthday party? 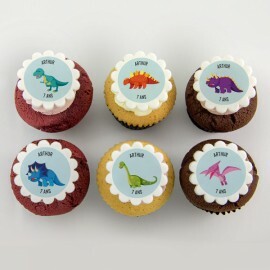 Our pure butter cupcakes with little dinosaur ornaments made of marshmallow fondant will please everybody! 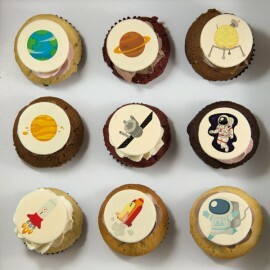 Whether for a birthday party or for a themed event, our pure butter cupcakes decorated with planets, rockets or satellites made of marshmallow fondant will make taste buds travel to new galaxies!